The wind plays sand symphonies and the desert laughs. We enter the music of the wind expressed in patterns, shapes, colours and textures. 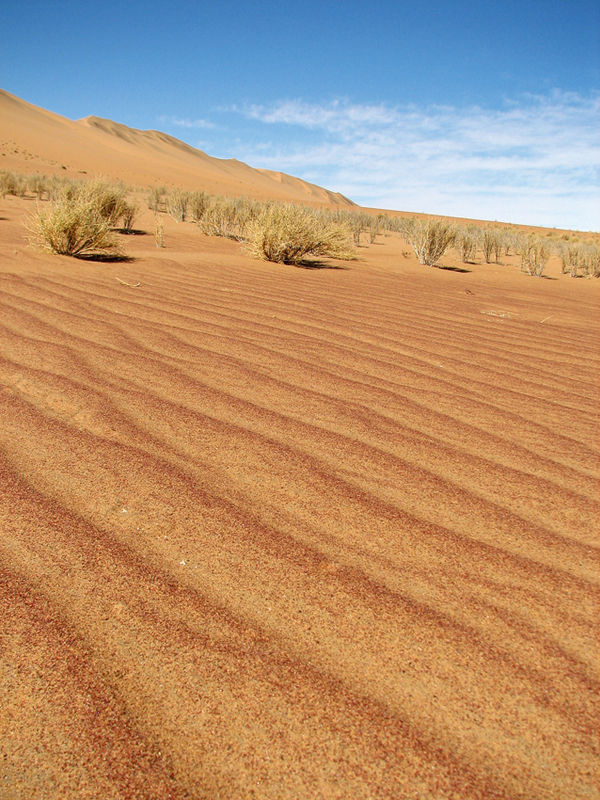 The Namib Desert has been around for over 80 million years. It is the great man desert of the world, grandfather of time, holding ancient earth memories and wisdom in its sands, and giving lessons in beauty. 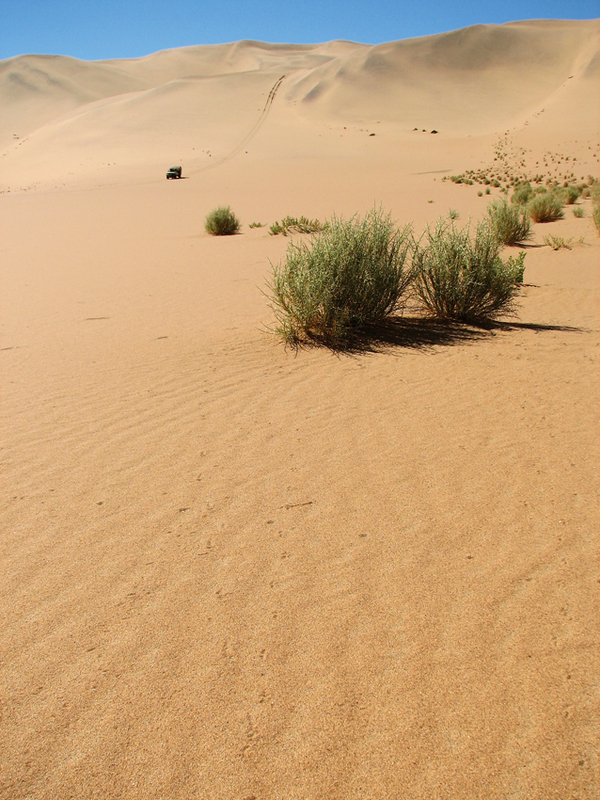 Visiting the Namib-Naukluft Park, you become the explorer seeing a new land for the first time. Previous tracks have been blown away with wind songs and you have the feeling of being the first person to set foot in this perfect sand sea. Once diamond zone, now sparkling conservation area, Namib-Naukluft is a playground where it is privileged to wander. 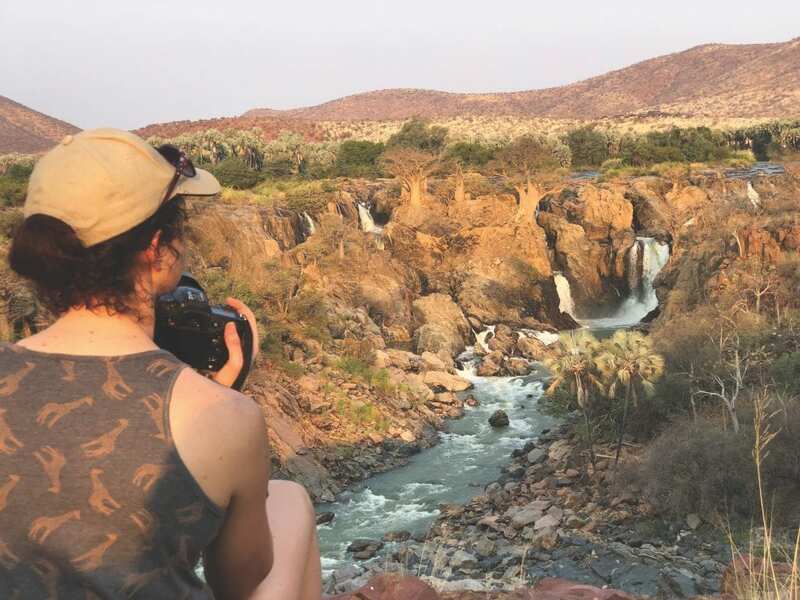 Tours through the park take the traveller on 4×4 drives over dune seas, and on informative tours that reveal the marvellous life that has adapted to survive in the desert, in an area that receives a scant 15–100 millimetres of rainfall a year. 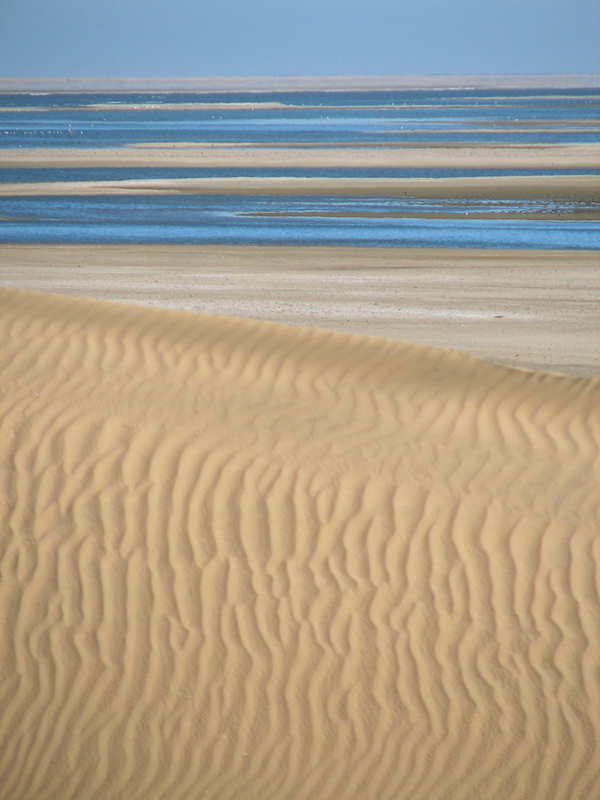 The sand was carried by the waters of the Orange River from the Kalahari to the Atlantic Ocean. Here the cold Benguela Current of the west coast of Africa moved it northwards, washing it in its waves until it was the perfect weight for the wind to carry to the coast. Transported by the elements, it built up over millions of years. And today the desert as we know it is laughing. Its sands are coloured by minerals, the black hues holding traces of magnetite, the red indicating iron oxide, and the garnet frosting that adorns the creamy dunes of the Skeleton Coast signifying the presence of diamonds. The Namib’s precious moisture comes from fog moving inland from the coast overnight. The cold Benguela Current travelling from the Antarctic meets the onshore winds from the tropics, generating the moisture that is vital to sustain life in the Namib, both flora and fauna. The barren appearance of the dunes is deceiving, concealing a unique ecosystem. Walking in this unspoilt kingdom, small tracks dot the sand. Like elfin pixies, creatures venture out at night when temperatures drop. Tracks seen on crisp mornings include those of dune-dwelling beetles, lizards, snakes, spiders and scorpions. Approximately 200 species of tenebrionid beetles live in the sands of the Namib. One of the better-known species is the fog-basking beetle that derives moisture from the Atlantic fog as it condenses on its body, having positioned itself so that water droplets run down into its mouth. The large, dancing spider known as the ‘white lady of the Namib’ lives in tunnels lined with spider silk under the honey sands. The golden mole swims through the sand, surfacing at night to forage for insects. The shovel-snouted lizard, which has perfected a thermal dance by raising its tail and two legs off the ground in unison to avoid the hot sand, buries itself at the first sign of danger, while the nocturnal translucent palmatogecko collects condensed fog droplets from its head with its long tongue. 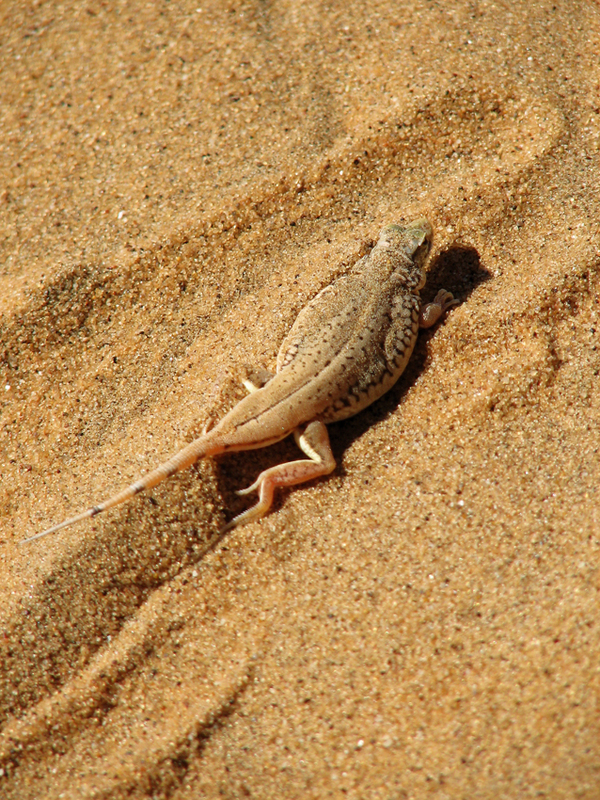 Two more creatures that have adapted in the world of sand as a challenge to life are the Namaqua chameleon and Namib side-widing horned adder, each adapting and evolving in its own remarkable way. Larger animals have also learnt the desert tunes. Springbok graze in the morning when the dew decorates the hardy desert plants. Gemsbok catch breezes on the top of dunes, the shallow veins in their noses cooling the warmed blood, like the radiator system of a car. 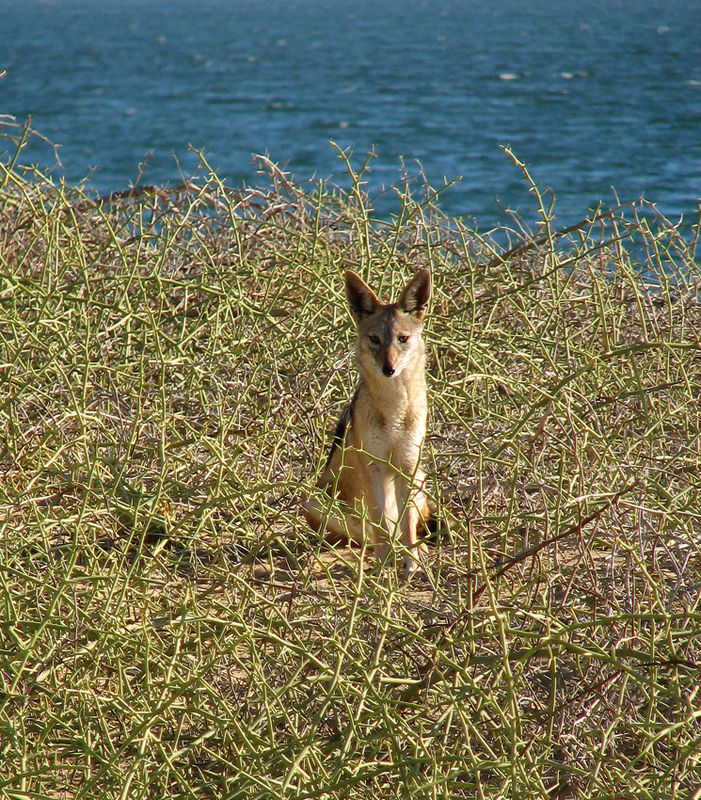 Black-backed jackal, brown hyaena and ostrich too have learnt desert secrets that enable them to survive in this so-called hostile environment. Whether driving over the sand, as in a small boat sailing across a wild sea, or looking closely to discover the life forms that call the desert home, the Namib is inspiring. 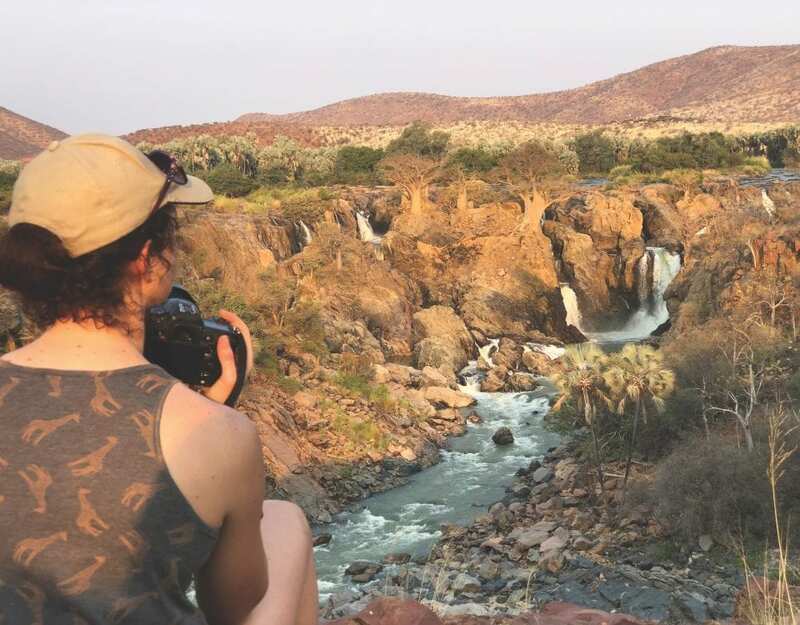 It is a unique environment of outstanding beauty, befitting a country of rare gifts such as Namibia. Above the world, where sand shifts and dunes roar, you are at play in the fields of the Lord. The wind plays sand symphonies and the desert laughs. This article was originally published in the Flamingo November 2007 magazine.